High Heat (Heat Stabilized) Glass Reinforced Polyamide 66 Market size was estimated over USD 2.6 billion in 2018 and the industry will grow by a CAGR of more than 8% up to 2025. The global high heat (heat stabilized) glass reinforced polyamide 66 market will be augmented by increasing global sale of vehicles. This product is majorly used for making various under-the-hood components where the ambient temperature is very high. It helps in cutting the manufacturing cost and reducing the weight of the vehicle. 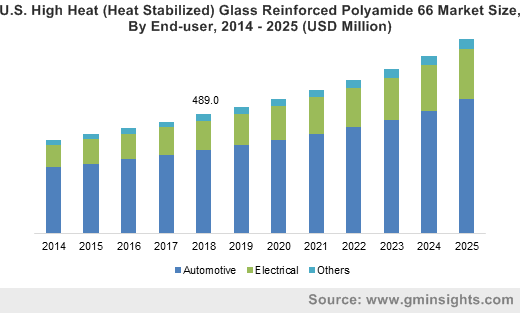 Continuous product developments in the high heat (heat stabilized) glass reinforced polyamide 66 market to enhance its heat resistance and efficiency will have a positive influence on the product demand in the automotive sector. Increasing industrialization, growing population and improving income level of the people in the developing regions of the globe would increase the demand for high heat (heat stabilized) glass reinforced polyamide 66 during the forecast period. The global automotive market has witnessed steady gains in the last decade with emerging economies accounting for a major share of the demand. Global automotive sales were recorded at more than 82 million units in 2012 which increased to around 97 million units in 2018, a growth of almost 18%. In terms of production, Asia Pacific accounted for 55% of the global production, which was mailed led by China, Japan, India and South Korea. These positive trends in the global automotive market will drive demand for high heat (heat stabilized) glass reinforced polyamide 66 during the forecast period as the product is used in manufacturing a wide range of automotive parts and components. Based on raw material, the high heat (heat stabilized) glass reinforced polyamide 66 market has been segmented into virgin and recycled. Recycled raw material segment will grow with a CAGR of more than 9% during the forecast period. Recycled grade will have a higher growth rate owing to its environmental benefits, low cost, and increasing usage in relatively non-critical applications such as electrical housings. Favorable government initiatives towards increasing the recycling rate of different materials to reduce the negative effect on the environment will further drive the recycled grade demand during the forecast period. Based on product, the high heat (heat stabilized) glass reinforced polyamide 66 market has been segmented into four product types including <20% GR, 21% - 33% GR, 34% - 45% GR, and >45% GR. Among these product types, 21% - 33% GR is a key segment accounting for a significant share of the market. The product’s cost-effective nature coupled with superior thermal and mechanical properties will augment its market growth during the forecast period. <20% is also a key product segment which will grow with around 8% CAGR from 2019 to 2025. High heat (heat stabilized) glass reinforced polyamide 66’s extensive usage in automotive and electronics industry will drive its demand during the forecast period. According to end-users, the market is segmented into automotive, electrical and others such as industrial components, heavy machinery, etc. Automotive end-user segment market value was recorded at more than USD 1.5 billion in 2018 and is expected to gain by more 8% CAGR during the forecast period. 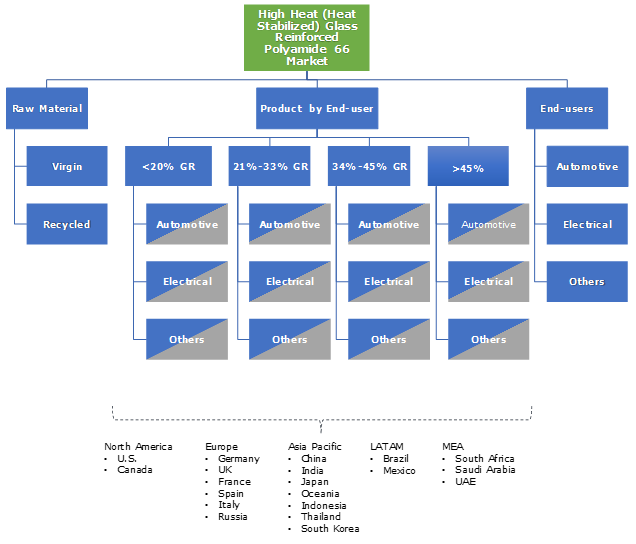 Increasing automotive demand coupled with shifting trends towards vehicle light weighting will drive high heat (heat stabilized) glass reinforced polyamide 66 demand for automotive applications. 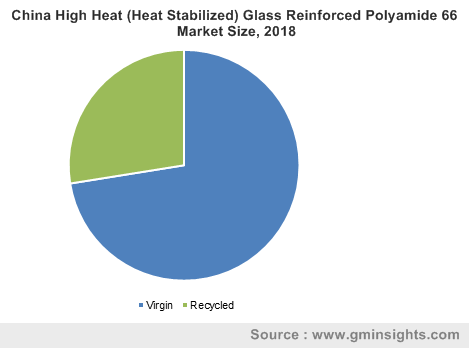 North America is a major high heat (heat stabilized) glass reinforced polyamide 66 market which accounted for around one-fifth of the market in 2018. Increasing automotive production in the U.S. is a major factor driving the North American market. Developments in the North American electrical industry will also have a positive effect on the product market growth. Europe is also a major high heat (heat stabilized) glass reinforced polyamide 66 market which will grow by around 5% CAGR. Rising automotive manufacturing rates in European countries such as Germany, France, and Italy will be the chief growth enabler. Favorable growth in European electronic components market will also propel the product market growth during the forecast period. Global high heat (heat stabilized) glass reinforced polyamide 66 market is characterized by the presence of many global and regional companies. Some major players in the market includes DowDupont, BASF SE, Ascend Performance Materials, Tenkor Apex, RTP Company, SABIC, Asahi Kasei, Solvay, LANXESS, and many more. Several smaller and medium sized players are also present in the high heat (heat stabilized) glass reinforced polyamide 66 market, mostly in China and other developing countries of Asia Pacific and Latin America. Rising demand for plastic materials with good thermal and mechanical properties for use in manufacturing a wide range of automotive and electrical components is the major reason behind the high heat (heat stabilized) glass reinforced polyamide 66 market development. With increasing demand for light weight vehicles, the use of plastics as a substitute for metal has become a preferred trend in the automotive industry. However, due to the highly challenging demand for vehicles in the present world, most of the polymeric materials which can substitute metal components are ruled out, either due to lower mechanical strength or high cost. Thus, high heat (heat stabilized) glass reinforced polyamide 66 was developed as a substitute product for metals in the automobile manufacturing industry and other high heat and high strength applications.